AutoSpeed - The fastest Mercedes of them all? 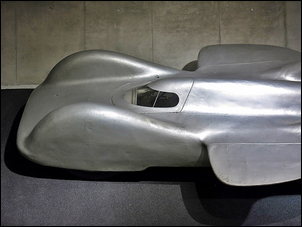 Extraordinary low drag aerodynamics, a 44.5 litre supercharged V12, designed by Porsche and built by Daimler Benz – this was one car that had the potential to be the fastest in the world. But World War II intervened and the car never ran under its own power. The Daimler Benz Type 80 – here’s what might have been. It was the mid-late 1930s, and German automotive race-car engineering was, if not reigning supreme, certainly rating very high indeed in world terms. Except in one area of endeavour – and an area that held enormous credibility in the times. The area where the Germans lagged was in the outright Land Speed Records (LSR) for cars, which were comprehensively owned by the British in the form of Malcolm Campbell, Henry Segreve, George Eyston and John Cobb. In fact, in 1938 and 1939, Eyston and Cobb between them raised the LSR from 312 mph, to 345 mph, to 350 mph, and then on September 16, 1939, to 357 mph. To beat 357.5 mph – around 575 km/h – was going to need a pretty special car. After all, George Eyston’s Thunderbolt was one amazing machine, with no less than two V12 aircraft engines giving a total capacity of 73.2 litres and developing something like 5,000hp (3,700kW). The car weighed over 3 tonnes and was over 8.5 metres long. It also ran at Bonneville salt flats in the US – a place of enormous space. But Hans Stuck, Germany’s premier driver, thought he could do better. He approached Ferdinand Porsche, who agreed to design a new LSR car, and then obtained access to a cutting edge aircraft engine – the Daimler Benz DB600 series of V12 engines. Daimler Benz agreed to build the car and it was decided the record attempt would be carried out on an autobahn in Germany. This choice of location was ludicrous, but for political reasons (read: Hitler) it needed to be an all-German attempt carried out in Germany. 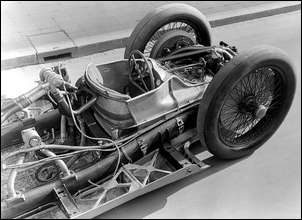 Ferdinand Porsche stuck with a chassis and suspension design he knew well from the Auto Union race cars he had designed. The chassis comprised two large diameter, longitudinal tubes. The front suspension used double trailing arms, torsion bar springs and friction dampers. Rear suspension used short swing-arms, again with torsion bar springs and friction dampers. Tyres all-round were 7.00 x 32 Continental Specials, and brakes (again on all six wire-spoke wheels) were 500mm diameter finned alloy drums. The transmission used a single gear and was via a dry triple-disc clutch with automatic flyweight governor. 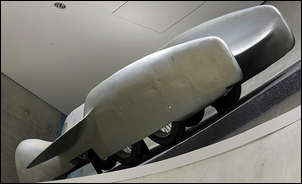 At 2.8 tonnes, the vehicle was similar in weight to other vehicles tackling outright land speed records. The engine weighed 807kg. Wheelbase and track were relatively small at (respectively) 3550mm and 1320mm (front) and just 1180mm (rear). The body height was only 1270mm – but again, this was typical of the LSR cars. However, even in that rarified field of odd shapes, you couldn’t say that the T80’s aerodynamics were usual. Sources credit either Baron von Fachsenfeld or Josef Mikcl with the aero design that was superbly streamlined, with a claimed drag coefficient of just 0.18. In addition to the all-enveloping low-drag body, thin horizontal wing extensions each side of the body were used to reduce lift. The initial aim of the design was to beat about 342 mph (550 km/h), but as the car was being developed, the LSR bar continued to be set higher and higher. On August 23, 1939, John Cobb lifted the record to 369.74 mph (595 km/h) – and to best that was going to need a lot of power. And was that power actually available? Here is probably the biggest question regarding the potential of the T80. 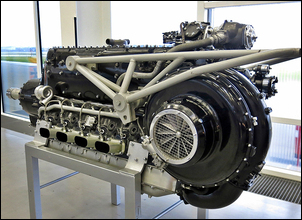 The DB600 series engine was sophisticated and advanced. It used two overhead valves per cylinder, mechanical fuel injection, and was supercharged. Two spark plugs were used per cylinder and the compression ratio was a relatively high 7.5:1. In LSR form, the engine was also to run on a very special fuel brew comprising methyl alcohol (63%), benzene (16%), ethanol (12%), acetone (4.4%), nitrobenzene (2.2%), avgas (2%), and ether (0.4%). Methanol water injection was also used. 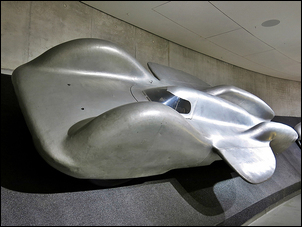 Porsche’s calculation was that to beat a LSR of 342 mph he would need 2000hp in this car – and the Daimler Benz engineers had suggested that would be possible from the single engine. But would enough power be available to beat 370 mph? A development of the DB600 – the DB 603A – increased the available power in aircraft form from about 1000hp to 1740hp (and so you’d expect commensurately more at ground level), and reports indicated an experimental DB603 had developed 2830hp in LSR trim. Mercedes Benz quote in their (current) literature a power figure of 3500hp at 3460 rpm, while conversely, data from Mercedes in the 1960s stated “approximately 3030hp”. Perhaps no one really knows how much power was available. However, in addition to its innovative aerodynamics, the T80 had another weapon in its arsenal. Incredibly, the car featured a sophisticated and automatic traction control system. Front and rear wheel speeds were mechanically monitored by the use of cable drives and a differential-style device. When speeds varied, the fuel supply to the engine was reduced. Wheelspin was always a problem with LSR cars, so this innovation may have created a significant advantage. So how fast could the car have gone? Any student of LSR attempts knows that ‘paper figures’ aren’t worth much at all – but then the engineering credibility of Porsche and Daimler Benz aren’t to be easily dismissed. When the car was discovered by the Allies after World War II, figures of 466 mph (750 km/h) were being bandied about. This seems unlikely – and downright impossible on an autobahn! A more realistic potential speed for the T80 might be 400 mph (650 km/h) – in 1947, John Cobb did 369.7mph (595 km/h) on about 2500hp in a very streamlined, four-wheel drive machine. Either way, the T80 remains one of the most fascinating cars to never run. Special equipment: The whole body could be taken off the double-tube frame for maintenance work, e.g. for changing tires or for working on the engine-transmission unit. The body is connected to the chassis with 8 quick mountings. The designers provided for centrally-operated pneumatic jacks in four different places.